Since 2000, our company Shri Vinayak Packaging Machines Pvt. 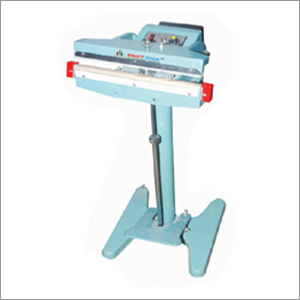 Ltd. is serving as one of the leading manufacturers, exporters of foot operated sealer machine. The product is extremely durable, consumes low energy and has the sealing length of 450 to 650 mm. In addition, it also features the sealing width of 2 to 5 mm, and is easy to install and maintain. Our company possesses ultra modern manufacturing unit, which covers a wide area of land. It enables us to fulfill the large requirements for foot sealer. To ensure systematic process of producing foot operated sealer, the unit is divided into various sections and have defined work responsibilities & roles to perform.